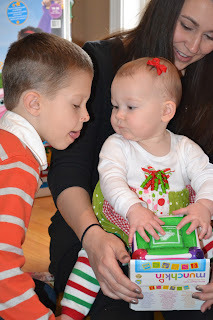 Baum Squad: The Baum Family Blog: Happy (Belated) Christmas! Eeeek! I know that this post is beyond overdue, but I knew if I didn't blog Christmas prior to first birthday party I'd never get it documented. We took about a million quite a few photographs, so I went through and chose 38 some of my favorites to share. I think it will be easier to just do that with minimal long-windedness from me! I realized as I was going through these that the video we took is probably much better, but I don't have the energy to make it into a pretty movie currently so photos will have to do. :-) So, sit back and enjoy the ride! Lilly and her cousin Erica. L loves her cousins, but she LOVES her some Erica. I think Erica loves her, too. Presents are seriously exciting. And by presents, I mean wrapping paper. But she really loves her ball popper. Thanks Uncle Chris, Aunt Andrea, Ryan, Erica and Ian! She also loves the Munchkin Mozart Magic Cube from Aunt Mere and Uncle Mikey. Testing out her new ride from Grandma Susie and Papa, with Erica's help. ...and giggling. Lots of giggling. I know that we took some family photos but I honestly have no idea where they are. :-( I'm pretty sure someone else took them. Happy girl playing with her new toys on the morning of Christmas Eve! She LOVES the Little People Animal Sounds Farm that her bestie gave her. Uncle Jeff came by to say hello! The whole family on Christmas morning. I LOVE the "matching PJs" tradition and can't WAIT to continue it with Lilly and my NEPHEW Mason (!!!). Thanks Grandmommy and Paw Paw for my ball pit! Being silly with PawPaw on Christmas morning. Daddy helping L check out her zebra activity center. Thanks Uncle Josh, Aunt Katy and Aunt Sydney! All of that traveling is tough! Beginning Christmas 2014 (when L is a little older), we will likely not do any traveling until the afternoon of the 25th. It is hard to tote around so much stuff. Lilly is spoiled rotten! She is so loved by so many, and we are SO grateful, trust me, but what is shown here is not even half of what the child got for Christmas. We had to steal borrow my parents' car top carrier to get it all home! Speaking of aforementioned rotten-ness, I learned from Christmas and L's birthday to save some of her toys while she doesn't know the difference. When she gets bored with a few toys (which is very common at her age), I put them into hiding and bring out a few she hasn't seen before. I begin to rotate in toys that she has seen before but has forgotten about and voila...Christmas and birthday all year long! We had such a wonderful and blessed holiday, and I can't wait for many more to come.